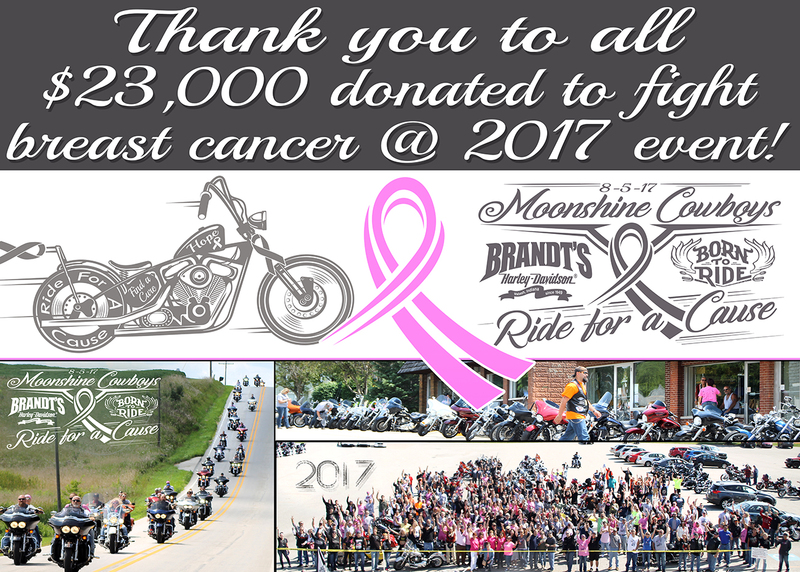 Francine's Friends: Moonshine Cowboys 2017 "Ride for a Cause" Raises Record $23,000! 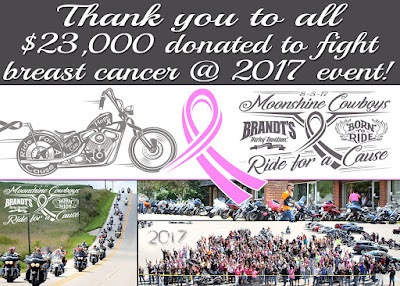 Moonshine Cowboys 2017 "Ride for a Cause" Raises Record $23,000! Francine's Friends board members were on hand when the kick stands went up! The 2017 Moonshine Cowboys "Ride for a Cause" with Brandt’s Harley Davidson took place on Saturday, August 5th, 2017. There were 204 motorcycles and over 360 riders – plus additional attendees at the live auction and dinner that followed the ride. The ride was created five years ago when the Moonshine Cowboys partnered with Robert & Toni Metzger (Owners of 95.9 KISS FM – WKUZ Radio). Toni lost her sister Susie to a rare form of breast cancer and created the ride with the Moonshine Cowboys in memory of her sister. 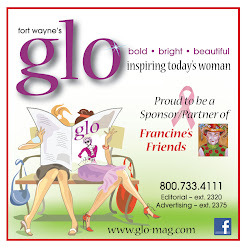 The group planned and hosted what has come to be an annual “fight breast cancer” fundraiser that has grown every year, with the proceeds going to Francine’s Friends. In 2016, the Moonshine Cowboys joined forces with Brandt’s Harley Davidson in Wabash. “It was a really unique event with lots of happy bikers committed to both a good cause and a desire to help others - I loved the great tee shirts everyone was wearing, the amazing generosity and the awareness so many bikers created for early detection,” said Mary Ann Ziembo, Francine’s Friends Treasurer and Board Member. The Moonshine Cowboys, Brandt’s Harley Davidson and 95.9 KISS FM – WKUZ Radio would like to thank everyone for making the 2017 event a great success. “We’re looking forward to 2018 being even more successful!” exclaimed co-founder and event organizer Toni Metzger. Additional information can be found on http://www.rideforacause.net or contact: Clarence Griese – Phone: (260) 571-1127 or Toni Metzger – Phone: (260) 571-8142. Event phoots can be found at: https://rideforacause.net.